Splendibird over at The Mountains Of Instead has posted another of my reviews. She politely requested that I cast my eyes over John Green’s debut novel, Looking For Alaska, and I gladly obliged. For once I steered away from sci-fi, fantasy, crime and popular science, delving instead into the heady world of tragic drama and it’s attendant emotional turmoil. Yipes. 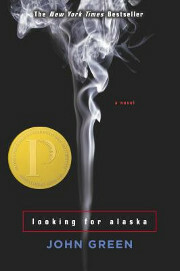 Looking For Alaska tells the tale of Miles Halter and his transition to life at an American boarding school. You soon realise that events are leading inexorably towards catastrophe and Miles’ world is soon turned upside down, part of his quest for a ‘great perhaps’. Tragic yet warming, sad and funny, always full of life, this is a great book. Thanks for the tip Splendibird!